EURid, the .eu and .ею registry manager, has announced the 16 finalists for this year’s .eu Web Awards competition. “We are extremely pleased with this year’s .eu Web Awards Finalists. There was a tight race between many fantastic websites this year, so these final 16 really earned their placement”, commented Giovanni Seppia, EURid External Relations Manager. Overall, the nomination and voting period for the 5th iteration of the .eu Web Awards tallied over 130 nominees with more than 9 500 votes. Additionally, the House of .eu category has 4 finalists - this is because two of the candidates received the same amount of votes. 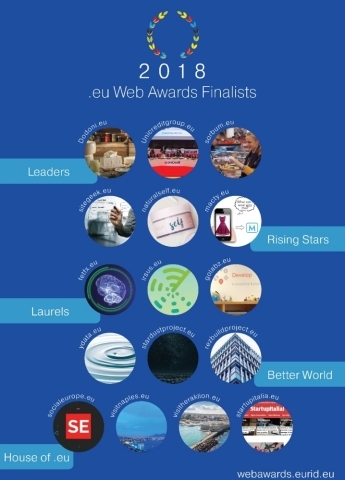 Now that the 2018 .eu Web Awards Finalists are known, EURid turns its attention towards organizing the gala ceremony on 21 November in Brussels, Belgium, where the winner per category will be announced. EURid would like to thank all of this year’s participants and invite those who didn’t make the cut the take part again next year. Keep up with the 2018 .eu Web Awards on social media through the hashtag, #2018euWA. The .eu Web Awards is an online competition, designed to acknowledge the best websites, using the .eu or .ею extensions, in five diverse categories. Learn more about the .eu Web Awards at https://webawards.eurid.eu/. An image gallery of past .eu Web Awards gala ceremonies can be found at http://events.eurid.eu/.